Scuttle: A Little Bit of Fashion & Alot of Sparkle: Pregnancy Update: 19 Weeks. 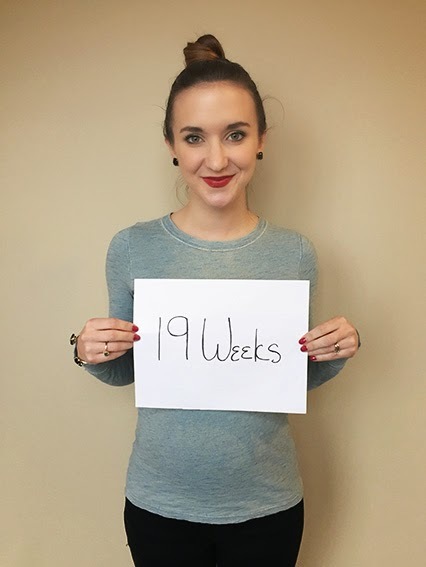 19 weeks! Next week I will be half way... unbelievable. Time is going by so fast & so slow all at the same time. My stomach is stretching & this little baby peep of mine is now 6 inches long. Hating: Grilled chicken, straight up chocolate (must be mixed with something) & that I can't drink margaritas! Can't live with out: My snoogle!! I swear by that thing. As someone who normally sleeps on their back, the snoogle has changed my life. Wearing: I got my first pair of maternity jeans & I love them! They are the Gap 1969 Full Panel Soft Sateen Jeans & they are so comfy, I highly recommend them (I am wearing them in the above photo).